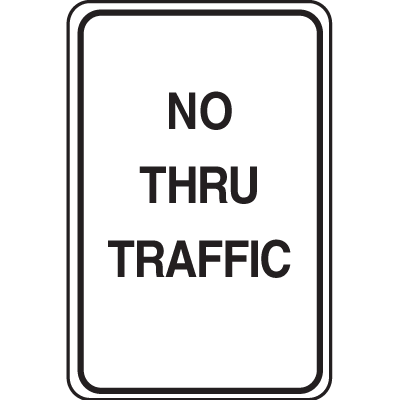 No Thru Traffic Signs designate which roads cannot be used as a through way, limiting traffic within areas where vehicles can be considered a nuisance such as gated communities, subdivisions and other similar housing areas. These signs are also useful as a safety precaution when trying to control traffic in larger facilities. These prevent lots of vehicles from passing through designated roads for deliveries between buildings, a potentially hazardous task when dealing with volatile chemicals and other highly reactive materials. That said, go pickup a few of these traffic control signs for your neighborhood or facility today! Control traffic around your neighborhood or facility with No Thru Traffic Signs. These signs help designate which streets can be used as a through way and which can’t. Limiting traffic flow in this manner allows you to also limit vehicular noise from buildings and otherwise quiet neighborhoods. It also helps designate certain roads as delivery drop-off points without any danger of causing traffic jams. Finally, once you limit traffic through a particular road, these can serve as a temporary parking area. Proper placement of No Thru Traffic Signs is essential if you want people to abide by it. The ideal placement of these traffic control signs is along the corner of the road where no thru traffic is allowed. This ensures that motorists are given ample warning to not enter the road if they just plan on passing through. Mount the sign on a strong and stable post, preferable weatherproof and made of steel so you don’t need to have remount it on a regular basis. Also, be sure to conduct monthly checks on the sign to ensure that it is clean and legible. This will also let give you ample warning when the sign needs replacement already.